Looking for quick and delicious? We’re here to help. 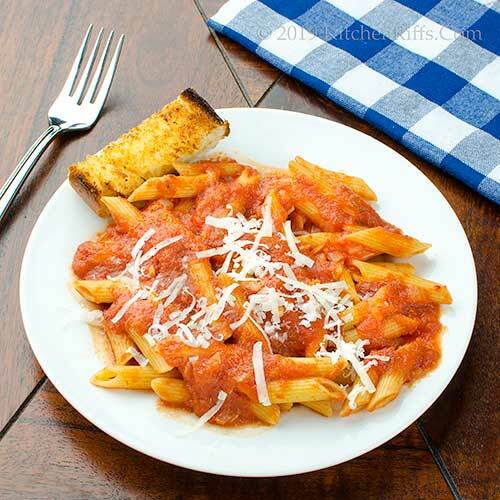 Our basic Italian tomato sauce (sometimes called marinara) cooks in half an hour or less. It also has a lighter, fresher flavor than meat-based ragù. It’s great with almost any pasta shape. You can also use it as a sauce for dishes like chicken or veal parmigiana. Or even as a topping when you make pizza. Weeknight quick, company ready. Perfecto! Although we love a hearty, rich ragù that simmers on the stove for hours, we often want something quicker and easier. This recipe is simplicity itself: Sauté some onions and garlic in olive oil, add tomatoes and seasoning, then cook until tasty. The whole process takes maybe half an hour. Should you use fresh or canned tomatoes in this dish? Both work, but we almost always use canned, because good-quality fresh ones rarely are available. You can use crushed or whole canned tomatoes (if it’s the latter, we crush them in our hands before adding them to the cooking pot). More about canned tomatoes in the Notes. Prep time for this recipe is about 5 minutes. Cooking time adds 20 to 30 minutes. This recipe makes enough to sauce for 1 to 1½ pounds of dried pasta, depending on how saucy you like to be. This sauce freezes quite well, too. So you may want to make a big batch and freeze it in portion-size containers. They’ll keep for weeks in the freezer. Peel the onion and cut it into ½-inch dice. Set aside. Peel the garlic and mince it finely or cut it into thin slices. Set aside. Place a 4-quart cooking pot over medium stovetop heat. When the pot is heated, add the olive oil. When the oil is hot (about 15 seconds; it’ll shimmer), add the chopped onion. Add salt to taste. Sauté until the onion is translucent (5 to 8 minutes). Add the chopped garlic to the cooking pot and sauté for 30 seconds. Then add the red pepper flakes, if using, and the oregano. Cook for an additional 30 seconds. Add the tomatoes (if using whole tomatoes, crush them in your hands before adding them to the cooking pot). Add a cup of water (perhaps a bit more) to thin the sauce. Stir to combine. Bring the mixture to a simmer and cook for 15 to 25 minutes (up to 40 minutes), until the sauce is tasty. Adjust the seasoning if necessary. Add the sauce to cooked (drained) pasta, then toss together. Dish up and serve. We usually garnish each plate with grated cheese and/or parsley. We often reserve a bit of this sauce, then top each serving of pasta with a dollop of it after plating. You can make this dish with fresh tomatoes if you wish. We usually don’t because good fresh tomatoes are available for only a couple of months in the summer. If using fresh tomatoes (plum tomatoes would be our recommendation), use 2½ to 3 pounds. If using canned tomatoes, should you go with whole tomatoes or crushed? Or diced? Canned plum tomatoes tend to have a “brighter” flavor than crushed or diced tomatoes. Plum tomatoes do break down as they cook, though they retain a somewhat chunky texture. We use plum, crushed, or diced tomatoes, depending on our mood. San Marzano tomatoes are considered the best canned variety for Italian red sauce. They originated in the town of San Marzano sul Sarno, close to Naples. They have fewer seeds and thicker flesh than many other tomatoes, plus a more pronounced flavor and less acidity. Imported San Marzano canned tomatoes can be expensive (and difficult to find). Tomatoes grown from San Marzano seeds are produced in the US, and are less expensive (although some people think their flavor is inferior to the Italian original). BTW, “authentic” canned San Marzano tomatoes are available whole only, not crushed. Other canned tomatoes can make really good sauce, too. We like Muir Glen and Redpack, two US brands. We suggest you buy several brands at your supermarket, then see which one pleases your taste buds. Use good-quality olive oil in this dish, and don’t skimp on the quantity (you can even use more than we specify). The flavor of olive oil is part of the charm of this dish. We use kosher salt in cooking. It’s less salty by volume than regular table salt (because the flakes are larger, they don’t pack a measure as tightly). If using table salt, start with about half as much as we recommend. But always season to your own taste. We generally use oregano in this dish. Some people find its flavor too strong, and prefer marjoram (which is a bit less pungent). If you have fresh basil on hand, you could add some to the sauce shortly before it’s ready to be served (roll it in a cigar shape and cut it into fine strips – a technique known as chiffonade). This sauce is ideal for long-strand pastas like spaghetti or linguine, though we prefer the more tubular pastas (rigatoni, ziti, or penne). 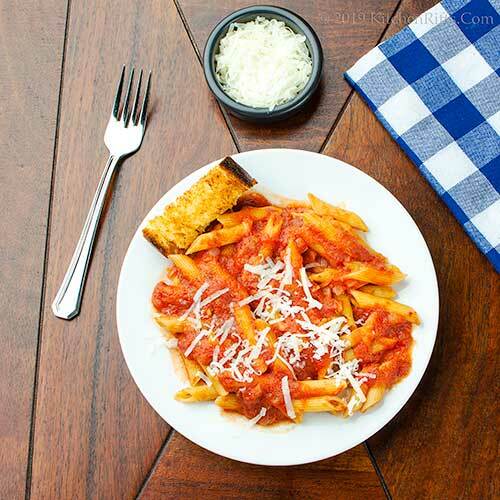 Our marinara sauce is nice with fresh pasta, of course. But we think it works even better with dried. We call our recipe “basic Italian tomato sauce” or “marinara sauce.” But some cooks differentiate between the two. As best we can tell, those cooks claim that marinara sauce should have fewer ingredients and cook more quickly (20 minutes or so) – which gives it a lighter, fresher flavor. Whereas “tomato sauce” may cook at least twice as long and tends to have more ingredients (such as carrots and celery – although we almost never use either in Italian tomato sauce). 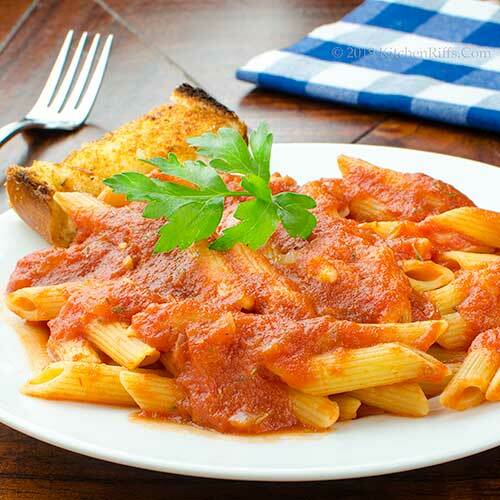 Some cooks also claim that marinara sauce should contain only garlic, never onion (while Italian tomato sauce tends to contain onion and no garlic). Well, we like both, so we include both. Our sauce is quick cooking and fairly light in flavor, so we call it marinara. But call it Italian tomato sauce if you like. We just call it good. And where did the “marinara” part come from, anyway? Well, marinara means “from the sea.” One story says the sauce is so called because it’s simple, made from ingredients that sailors would have on hand. Sounds like made-up etymology to us, but we’ll go with it. Only seventeen! Plus a few decades. Besides meat sauce, Marinara is another my favourite! The plate of pasta looks mouthwatering. Hi Angie, we make meat sauce a lot, but probably make this one more often. So good! Thanks for the comment. I enjoyed finding out about the tidbit about the garlic/onion debate when it comes to Italian sauce vs Marinara sauce! And... I see why y'all keep coming back for more of this sauce - it sounds delicious! Hi Shashi, we like both onion and garlic so we use both! :-) Thanks for the comment. There is nothing like a simple tomato sauce. So much better than a jar. You are right about tomatoes. My son and I once did a taste test and you can definitely taste a difference. I can't live without onion and garlic so this is perfecto! A must basic sauce for sure, and liked you sad good to have a bit in the freezer. I would go for whole plum canned too. Hi Abbe, we do a taste test every few years -- just in case. :-) Thanks for the comment. Hi Evelyne, so nice to have some of this in the freezer! :-) Thanks for the comment. We have been trying some Marcella Hazan recipes lately — she also favors simple sauces, but I think her most famous tomato sauce is even simpler than this. Just tomatoes butter onions! We plan to try it. But yours sounds like another good one to try. Hi Mae, I've made that sauce of hers! In fact I've made all of her simple sauces, and they're all good. This is a little more complicated -- more in the Italian-American tradition. Thanks for the comment. There's nothing quite as delicious as a simple sauce and this one sounds great. Most of the time though, I add a pinch of sugar to balance the tomato acidity in a sauce. Mine is pretty similar to this. Thanks for sharing! Hi Pam, a lot of people do like to add a bit of sugar to their sauce -- really good point. I actually like a bit a acidity, so I usually don't. Thanks for the comment. I always need a tomato sauce like this on hand. If I had a dime for every time I wished there'd been a jar at the ready . . . Happy you're okay with canned tomatoes -- I really only use fresh during the summer when they're much sweeter. San Marzano is my favorite brand too. :-) Thank you! Hi Valentina, fresh tomatoes are wonderful, but just not an option most of the year. And canned whole tomatoes are processed with minimal processing at their peak of ripeness -- assuming it's a good brand -- so they're pretty good. Thanks for the comment. I agree this is almost an essential recipe for any week and multiple dishes. Am lucky Down Under to be able to access fresh tomatoes all year since I avoid anything tinned if at all possible for multiple health reasons. My two 'always' additions are some tomato paste and quite a bit of parley: have just looked at half-dozen 'local' recipes and all include such . . . horses for courses. Oh, oregano definitely :) !! Hi Eha, we always skip tomato paste for a short-cooked tomato sauce, and always include it when making a sauce that's going to cook at least 45 minutes. But we also change things up all the time. :-) Thanks for the comment. Hi Merryn, we love those chilli flakes! :-) Thanks for the comment. Hi Dahn, they're such a yummy tomato, aren't they? :-) Thanks for the comment. Being Italian, you’re speaking my language here. Love pasta and sauce! I also always used canned tomatoes. I like the consistency it gives me in always ensuring my sauce tastes the same each time. It's always good to get back to basics every once in a while, if only to remind ourselves just how good the basics can be. And a good tomato sauce is very good indeed! And I'm with you on the canned tomatoes. 9+ times out of 10, they'll give you better flavor (if you're using the right brand) even in the summer. From scratch pasta sauce is a must and tastes so much better than that from a jar. 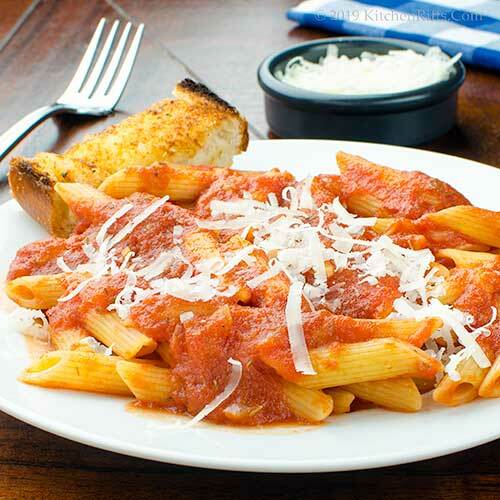 When the weather is cold a plate of pasta is just what we need to warm up from the inside out! Hi Ashley, fresh tomatoes can certainly give us the "freshest" flavor, but canned --if you use a good product -- are really good. :-) Thanks for the comment. Hi Natalia, it really is, isn't it? :-) Thanks for the comment. Hi Frank, you really do have to find a decent brand, don't you? But when you do, gold. :-) Thanks for the comment. Hi GiGi, we're pretty BASIC too! :-) Thanks for the comment. Hi Bobbi, we could eat pasta almost every single day of the year! Love the stuff. :-) Thanks for the comment. You just can't beat homemade marinara! I love how quickly this comes together! Hi Kelsie, quick and really good -- our favorite combo when it comes to food! Thanks for the comment. This is a wonderful recipe. I like switching things up sometimes, because a good tomato sauce is a good tomato sauce! Sometimes all I do is heat up lots of minced garlic in olive oil, and add good tomatoes! Not traditional, but really nice and flavorful. I like onion and garlic too! Canned tomatoes means that this classic recipe can be enjoyed all year round. fabulous! I love the simplicity of this pasta...light and so flavorful...specially with freshly grated cheese...indeed perfect for weekday meal. Thanks for the recipe John, I hope you are enjoying your week! I'm always on the lookout for my next favorite marinara sauce! I am giving this a try - sounds perfect to me. Thanks John! Hi Mimi, that sounds wonderful! :-) Thanks for the comment. Hi Deb, that's the nice thing about canned tomatoes -- most of us have them in the pantry all the time, so we can make this whenever the mood strikes. :-) Thanks for the comment. Hi Juliana, hard to resist freshly grated cheese with this! Thanks for the comment. Hi Tricia, one can never have too many different recipes for marinara sauce! Even though most of them are pretty similar. :-) Thanks for the comment. Thanks for the heads-up on the San Marzano tomatoes- I'll keep an eye out for them. This recipe screams out 'starch and flavor'- especially with the extra toasted bread on the side. Who could go wrong with that? Plus, 'mama mia' is my favorite expression- I especially use it in my French conversation class when I flub up. Hi Fran, given my rudimentary French, the only thing I'd be saying in a class like that is mama mia! Mrs KR, on the other hand, has excellent French and would never say it! :-) Thanks for the comment. This is a solid tomato sauce for sure. Yours is very similar to what we make, but I like to add a bit of grated carrot. We always make a big batch of tomato sauce and freeze it in 2 cup containers. We then have a great building block for many recipes. With a sauce like yours, I say just put it on simmer, then put on some Boccelli and take Mrs KR for a dance on the kitchen floor. We do it all the time. A delicious sauce and so full of flavor! We like the onions and garlic both in the sauce as well! Hi Ron, we freeze ours in 2 cup containers too! Don't dance on the kitchen floor, though -- gotta start. :-) Thanks for the comment. Hi Kelly, onions and garlic play so nicely together, don't they? :-) Thanks for the comment. Marinara isn't quite my thing, because cooked tomatoes freak me out. But my dad would devour this. Hi Laura, make it for your dad. :-) Thanks for the comment. Delicious & Simple - those are the best sauces in my opinion! Hi Vicki, simple is SO appropriate for us. :-) Thanks for the comment. Hi Gerlinde, we're supposed to get a bunch of snow tomorrow -- we'll need this comforting dish! :-) Thanks for the comment. Love the ABBA references! John - this is definitely the kind of thing we love for weeknights! And I agree - so fresh tasting. All I can say is, “Gimme, Gimme, Gimme” this Pasta - before midnight, please! Hi David, :-) Thanks for the comment. This is a recipe everyone should have in their arsenal. It is wicked easy and comes in so handy for so many things. Hi Carolyn, quick and tasty -- our favorite kind of recipe! Thanks for the comment. Hi Gingi, it's good stuff. :-) Thanks for the comment. Hi Sherry, there are always cream sauces. :D Thanks for the comment. Hi Liz, we DO like meat sauces, but sometimes that's just too heavy or inappropriate for whatever dish you're making. We love to freeze this! Thanks for the comment. Hi Charlie, we've stopped planting tomatoes because the squirrels always get them. :-( But we used to love making sauce from our own tomato plants! Thanks for the comment. I've never heard that there's a difference between "tomato sauce” and “marinara," but once you called out what it is, I could easily see why there'd be a distinction. Your sauce sounds really bright and fresh - and easy to throw together. Thanks for the recipe! HI Jeff, whatever you call it, it's good stuff. :-) Thanks for the comment. Perfect! Homemade tomato sauces are really do delicious! I need to take the time to make them more often. Hi Amy, so simple, so satisfying. :-) Thanks for the comment. Hi MJ, we really like quick, easy, and tasty. :-) Thanks for the comment. Hi Rocquie, this is ridiculously easy and fast to make, isn't it? Thanks for the comment. I love marinara sauce and I never made it at home .. out of laziness I guess. Thanks for sharing such a nice recipe. Hi Amira, it's easy to get lazy, isn't it? Fortunately this recipe doesn't take much work. :-) Thanks for the comment. It's hard to beat a good Marinara sauce, perfect for so many dishes. Hi Emma, Marinara is so simple yet SO satisfying. Love it! Thanks for the comment.